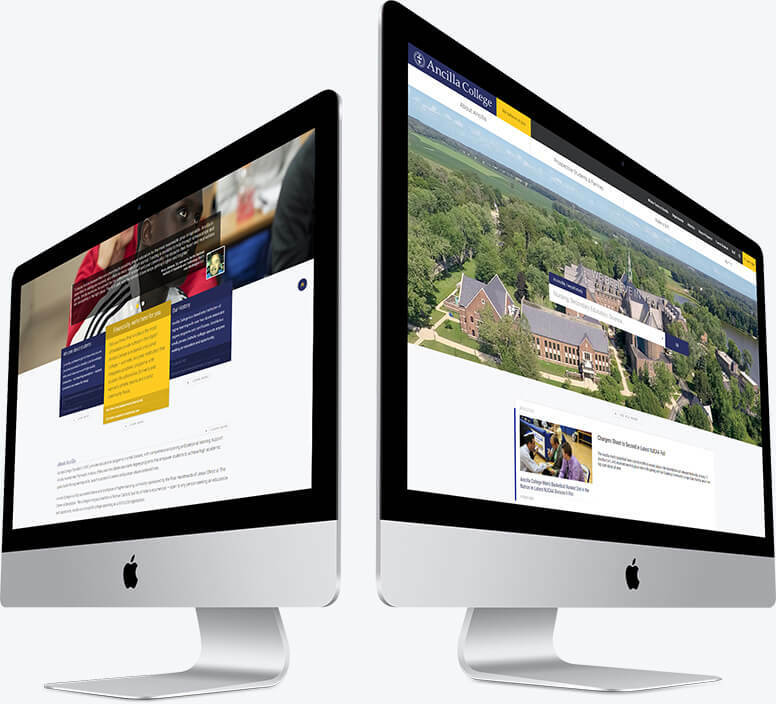 A redesign, re-organization, and re-development of a college website using WordPress and top-industry navigation practices. It's always a treat for us to start a project with a mess of a site and turn it into a well-organized piece of work. Many college websites are hard to navigate, clunky, and awkward to use. The overall user interface and user experience (UI/UX) is terrible and almost unusable. This problem isn’t entirely their fault; colleges have a ton of information to display with no easy way to categorize it. 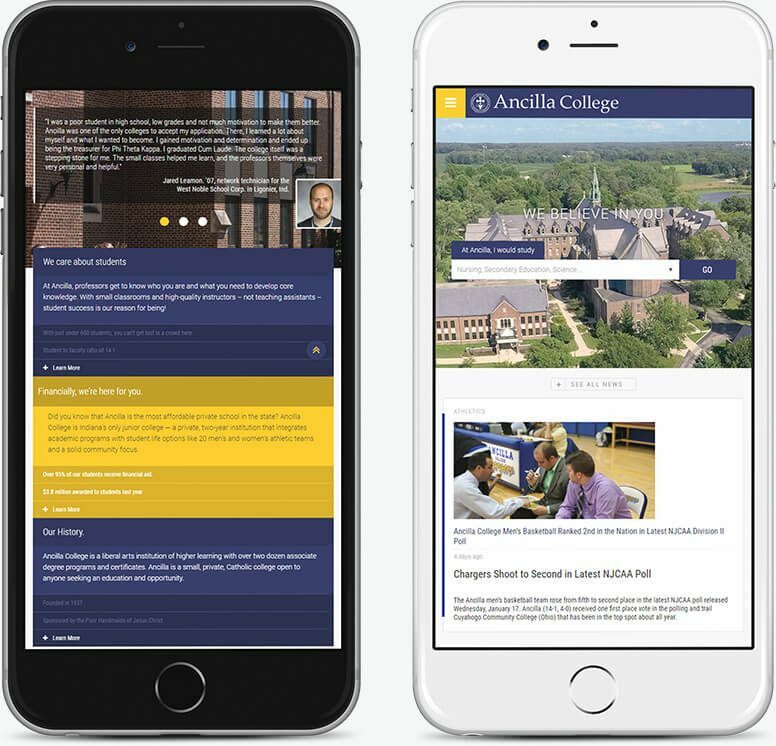 Our goal with Ancilla college was to take the user flow and simplify it so people could go precisely where they needed quickly and efficiently. We proceeded to group content based on each class of users. We then developed an organizational structure which felt natural and organic instead of confusing, allowing users to navigate the site quickly. After we spent time breaking down the content of the site, we moved on to implementing a design. Our goal for the site was to keep the look clean, usable, and professional. We did this by emphasizing the use of whitespace in the navigation and within the content so critical information would stand out from the page and allow the users to search for more detailed information only if they were interested. 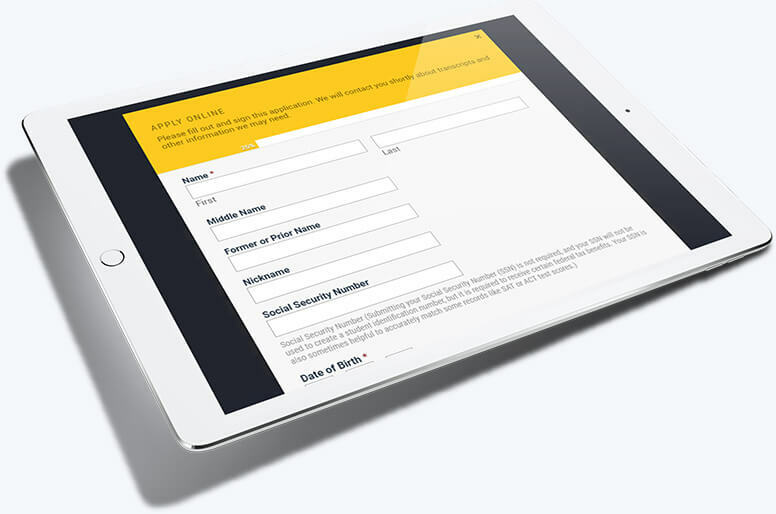 By doing this, we reduced the time students and faculty had to spend on the site significantly. However, aside from those already at the college, a significant focus of the user interface was centered around prospective students. We looked into the data from the previous site and noted prospective students most often look for programs of education which are most interesting – in fact, for over 80% of potential students, this is the first page they navigate to as soon as they land on the site. As a result, in the header navigation, we highlighted this area of the site. To further emphasize upon this fact, we added a searchable box to the top of the homepage to allow prospective students to immediately search for their field of study instead of having to sort through a long list of programs. After finalizing the design, we started to build the content management system. Moreso than in the past, this CMS required plenty of planning and user flow charts. This extra planning was due to the number of administrators managing the site – each with different permissions and content management levels. We started by working with the administration to define the roles of users who would be working with the CMS. After determining their capabilities and editorial capacities, we configured user roles to ensure content entry would be as comfortable as possible. After assisting with the initial content entry, we provided educational screencasts as well as several on-site tutorials on how to use the site. We then offered a year-long assistance program should any training need to completed after launch. 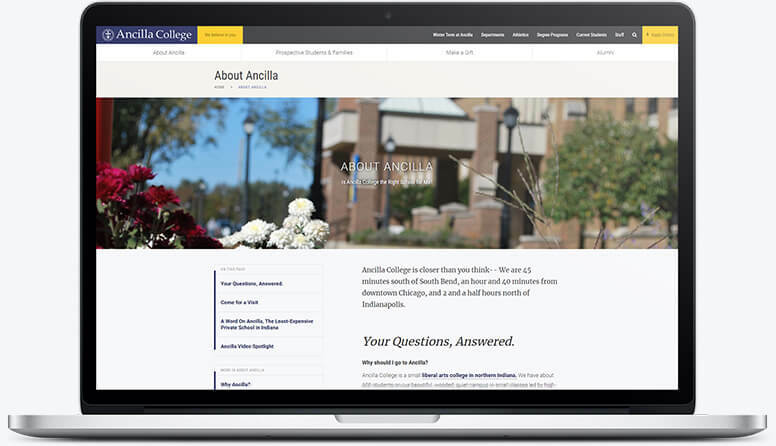 For Ancilla, College, we wanted to keep the layout as simple and straight-forward as possible. As you can see, we separated the navigation into main and secondary categories so that users can focus on the most-used information on the site. On mobile, we focused on a typographical layout as well as visual segmentation between sections of critical content. Instead of creating a dedicated page for an application form for the college, we discovered through testing that there was a higher conversion rate when users could apply without having to navigate to a separate page. Due to the complexity of the subpages and their content, we developed a standardized method of sidebar navigation that would allow the users to navigate within the current page, as well as the tree of pages related to the one they were on. This led to a decrease in the number of pages users had to visit to find the information they were looking for.